Today is a very important day at Pirate Prerogative. 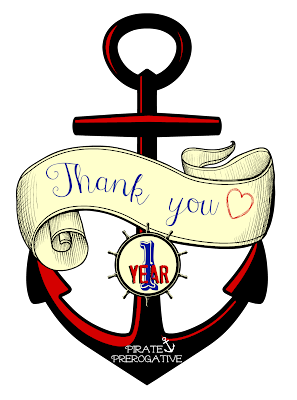 It's national Talk Like a Pirate Day AND my one year blogging anniversary. Don't worry, I won't write in Pirate lingo and annoy you. After all, it's TALK like a Pirate day. I know some of you have been around since the beginning, while others may just be discovering my blog. Either way, I am tremendously appreciative. I wanted to share the posts that went live that day (even though some things make me cringe now that I know more about blogging) so you can see where it all began. Blogging has been such a life changing experience. I have made so many amazing friends both online and in real life. The sense of community is overwhelming, as is the willingness to help one another. I look forward to many more years of blogging future and getting to know you all more. I love reading your comments, so please keep them coming. I will continue to work to improve my blog and keep you entertained. I would love yo grow the Pirate Prerogative community too, so please share with your friends.